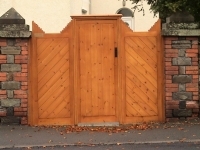 We are a small but established carpentry business based in Neath, having moved from Skewen to larger premises. We enjoy challenges! We thrive on change from traditional to contemporary use of a natural product - wood. We are using more and more manufactured and engineering timber products to achieve an equal and sometimes better result in our manufacture of bespoke joinery.